Both 1999 and 2000 are regarded as very fine vintages for the Northern Rhne region of Condrieu. It is on this hallowed ground that the Viognier grape produces some of its finest wines. The soil in Condrieu is mostly granite. The appellation covers some 252 acres. Because of its proximity to so many Michelin Guide 3-starred restaurants, much of the production of Condrieu is spoken for well before the wines are made. As a result, prices for these wines has been rather high. California vintners have been quick to jump on the Viognier bandwagon. Having just tasted a couple of flights of those at a recent wine judging, I can't say the local versions warrant a premium price (in most cases). Here's what we found in tasting a set of Condrieu wines, challenged by a "mystery" wine from California. 8th Place: E. GUIGAL 2000 Condrieu "La Doriane"
One person found a "skunky" note to this wine, while another taster described it as "So oaky, I could mistake it for a Chardonnay." Another taster did describe it as "...a bad California Chardonnay," saying it's "poorly executed." Someone else found it to have a noticeably high level of SO2, while another taster found this to be "hot, sour and lacking fruit." One person found this to be "quite rich, with bitter almond notes and hints of bacon-like aromas and flavors." I liked the hugely expressive aromas of this wine. Yes, there's an ample amount of wood, showing a vanillin quality, but I felt there was a corresponding amount of apricot and pineapple to match the wood. Very stylish! I gave it a one-and-a-half to two-star rating (3 stars maximum, no stars being a standard or ordinary quality wine). "Lactic, greasy and dull with little fruit and no structure." said one fellow. Another person felt this wine is "sharp, bitter and minerally." Someone else described it as "Stony, with jasmine and peachy flavors and a touch of white pepper spice." What they described as "spice," I interpreted as an earthy, slightly dirty, mushroomy note. There's decent structure and all, with the wine fairing marginally better on the palate than on the nose. No stars. "This is a peculiar wine. It has some rose petal notes but an odd, strong eau-de-vie-like character on the palate and is uncharacteristic of Viognier." said one gentleman. Another taster found "a nice apricot nose, but bitter, bitter, thin and acidic!" One fellow said it had a "nice nose, being fruity, but it shows nothing on the palate." Another taster found it to have "good balance," while someone else encountered "apple and pear flavors." Someone found "apricot notes and crisp, youthful fruit with pear and peach tones. I liked it!" My view was of a wine showing an exotic, almost lime-like aroma, but it was a bit light compared to some others. It's a simple, straightforward white wine that goes in the direction of Viognier, but it's not especially deep or intense. Standard quality. 5th Place: Patrick & Christophe BONNEFOND 2000 Condrieu "Cte Chatillon"
The first critic described this as having "light peach notes with some lactic tones, but it's insipid." Another taster found it to be "sweet." (I tested it and the wine is quite dry.) One fellow described this as having a "tropical fruit nose with a hint of petrol. It has a nice integration of fruit and oak." Another positive comment was sounded by one who found "a nice nose of apricot and white peach." Someone else felt it was "the most classic Viognier, with hints of rose petal and peach, though it's a bit flat." One scientifically-minded taster encountered the character of "Wrigley's Juicy Fruit gum" in this wine. I found the nose of this to be exceptional! There's a lot of ripe peach notes without the fruit being over-ripe. This features fresh notes of apricot and a hint of citrus with a very mild dose of oak. The nose, for me, is slightly more impressive than the wine on the palate. I gave it a two star rating. "Notes of cinnamon on the nose with a paint-thinner component." was how one person reacted to the wine. Another taster described it as showing a "butterscotch nose with sweet spices." A third person found "green apple notes in this lean, grassy wine. It's more like a white Bordeaux and not very characteristic of Viognier." Someone else found "ginger ale spice notes with a lactic character on the palate and a toasty finish." Other utterances included "odd and quirky" (the wine, not me) and "not typical" (the wine, not referring to me). I found the nose to be really big with a lot of ripe to over-ripe elements. There's a unique spice character here, reminiscent of cloves, nutmeg or sharp ginger. A bit of wood is noticeable, too. The flavors are intense and striking, showing candied orange, cooked pears, wood all in a powerful package. One star+. "Atypical Viognier...it's more Chardonnay-like." said the lead-off batter, adding "It's kind of buttery and soft." 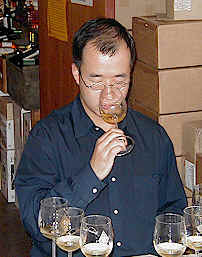 Someone else found a "smoky nose," while a third taster found "Caramel-like flavors and some heat from the alcohol." Another person marked it down for its "short finish." Someone else said it "didn't have much structure." I found this to have a nice fruit note on the nose, with a very mild woodsy aroma. There's a touch of citrus and peach to the fruit. Nice. One star. 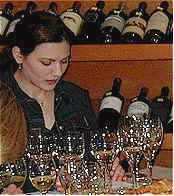 "Here's a typical Viognier," said one taster, "It's fruity and complex with a pretty good flavor and a hint of bitterness." 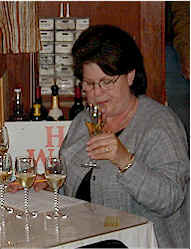 Another person found "Smoky, lactic notes, with creamy, almondy flavors." Someone else found the aromas to be reminiscent of the fragrance of "bread dough, with very good balance on the palate." On my first pass through the line-up, this was rather shy on the nose. It seemed to open a bit, with nice fruit of peach and apricot. The flavors echo the aroma, with some richness and nice length. One star. "This is big, rich, with lots of peach and apricot notes and is probably a California wine. It's a bit sweet, with a long finish and lots of forward fruit." Someone else found "A lot of honey and apricot notes with a long, cool finish." One woman described the aromas as reminiscent of "Fuji apples, Sweet William flowers and a hint of a yeasty note. The slight residual sweetness adds some richness and tames the hotness of alcohol and astringency." A less enthusiastic taster said it lacks "acid, showing a lactic oaky characteristic and overall it's dull." I thought the nose was very good, showing peach notes and apricot. There's an almost waxy fragrance here, too. Quite complex. I found the wine hot on the palate which seemed to cut off the fruit a bit early. A sharp finish moved this down in my ranking. The wine, by the way, is dry this vintage. I think a few earlier versions had a touch of sweetness. One star+.